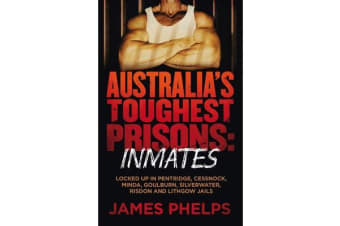 Porky Pig’ stalks the yard, snorting and grunting as he stares down the prison guard.‘Whatcha looking at,’ yells Martin Bryant, Australia’s worst serial killer.The guard stays silent. Says nothing. He simply takes one step towards the monster, now fat, bald and broken.‘Leave me alone,’ he screams.He then runs to the corner of the yard where he crouches, cowers, and calls for help like the coward he is.Bryant – who killed 35 people and injured another 23 at Port Arthur in 1996 – is a 160 kg slob who trades Mars Bars for protection in Risdon Prison. Nineteen years after Australia’s worst massacre, his blond hair is gone, and so is his self-righteous smirk . . . but he is as evil as ever. Bryant has attacked several jail workers and has showed no remorse for the crimes that shook the nation. He is just one of the killers you will meet inAustralia’s Toughest Prisons- Inmates.You will hear from the inmate who almost escaped from Silverwater Jail in a stolen helicopter, from the rugby league player who almost became a drug mule, from the bikie boss who ran a million-dollar jail drug trade, from the founding Brothers 4 Life members on how the violent gang ran a crime empire from within jail and from the men that watched Carl Williams beaten to death inside Victoria’s most secure jail.The secret lives of Australia’s most evil men will be revealed for the first time, with Inmates going on the record to talk about killers like Bryant, Ivan Milat, Neddy Smith, Carl Williams, Mark ‘Chopper’ Read, Michael Kanaan and Lindsay Robert Rose.Award-winning author and journalist James Phelps reveals the horror of life inside Australia’s most notorious jails including Grafton, Pentridge, Minda, Risdon, Silverwater, Bathurst and Lithgow.